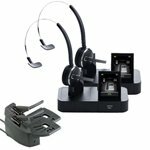 The Jabra PRO 9470 monaural wireless headset lets users answer calls from their mobile phones, desk phones, or softphones up to 450 feet away. Audio features like Noise Blackout - Jabra Noise Blackout technology eliminates disturbing background noise such as wind, surrounding conversations or traffic to enhance your voice. noise cancelling microphones that filter out ambient noise and Jabra Safe Tone acoustic protection make the PRO 9470 a versatile choice for the office professionals. Touchscreen Display - Select models in the Jabra PRO 9400 series family feature an exclusive touch screen base that simplifies call management. Noise Blackout - Jabra Noise Blackout technology eliminates disturbing background noise such as wind, surrounding conversations or traffic to enhance your voice. 150m Wireless Freedom - Get wireless mobility up to 150 meters to fully control your Jabra hands-free solution with DECT technology. Answer calls, multitask and move freely around on your terms. Remote Asset Management - Configure and implement the company's audio devices 100% remotely from one central point. You get the latest features and functionalities on one go with Jabra Xpress, a web-based solution.